Protect Yourself, and Your Family! By obtaining a Texas License to Carry a Handgun also known as an LTC, you will not only be able to better protect yourself, but your family as well. This 5 Hour course will give you the instruction and testing you need to complete your application with The State of Texas for your licensing. Our classes are fun but very thorough! Our goal is to make sure you have a solid understanding of Texas carry laws and you receive the highest quality of instruction from our Master LTC Instructors. We look forward to having you join us soon! Class Cost: $100 to be paid in full in order to reserve slot. The minimum size for classes is 10 people. Classes that do not have at least 10 registrants may be rescheduled. What is a LTC? A LTC (License to Carry a Handgun) allows for the concealed, or open carry of a firearm in the State of Texas for personal protection. LTC’s are administered by the Texas DPS under the authority of the Texas Government Code Chapter 411, Subchapter H. The DPS licenses individuals to carry concealed handguns within Texas, and evaluates the eligibility of applicants through criminal history background checks and monitors those currently licensed to ensure their continued eligibility. The DPS also trains and certifies instructors who teach the required course to applicants. What are the costs involved with getting my LTC? The cost of the class: $100 to be paid in full prior to class. Judicial Officer, Felony Prosecuting Attorney, and More. See LTC Fee Table for a more information and a complete list of applicable discounts. At what age can I get my LTC? You must be 21 years of age to receive your LTC. However, you may take the class before your 21st birthday as long as you are turning 21 in the same calendar year. How long is this class? 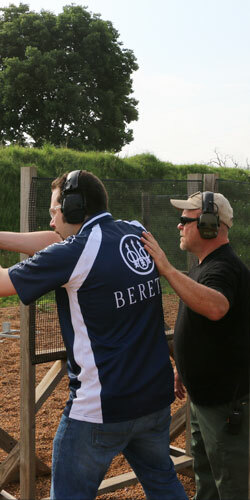 The class lasts 5 hours, including the shooting tests. How long will my LTC be valid? Initial licenses are valid for four year terms. Renewal licenses are valid for five years. The license will remain valid as long as you continue to meet all the eligibility criteria. How do I register for this class? Just click the SIGN UP button below. Clothing that is suitable for shooting range and weather conditions. Must be a .22 caliber or higher to qualify. There is no minimum caliber to legally carry as long as it is a legal pistol. There is no longer a classification of concealed handgun license. If you qualify with a revolver you can carry a semi-automatic. The majority of students pass the proficiency test when they have completed shooting at 3 and 7 yards. Shots that hit just outside the ring but break the line count as the higher score. The Texas LTC shooting test passing score is 175 points out of 250 points or a score of 70%. The state allows for three chances to pass the shooting test. As of September 1, 2013 class time and range time are not required for LTC renewals. Original licenses are valid for 4 years, renewed ones are valid for 5 years. LTC renewals are handled by the state. For a link to the license renewal form Click Here. Upon completing this form it will be sent to our staff to be reviewed. Once your application has been approved we will contact you for payment information. Your slot in the class will not be reserved until payment information has been collected. If you have any questions, or haven't yet received a call contact Pat Marion at 936-295-5786 or by email at pat@ableammo.com. I understand that by registering online I must produce proof of payment to be admitted into the class.